BASEHOR, KAN. ----- Entering a basketball game as a slight underdog for the first time in the 2014-15 season, the Basehor-Linwood Bobcats delivered a big statement win over a loaded Park Hill team. Claiming its second straight Basehor-Linwood Invitational Championship and seventh overall, the Basehor-Linwood Bobcats defeated Park Hill, 69-61, in a back-and-forth affair. Early on, it was Basehor-Linwood's unsung heroes that helped the Bobcats stay even with the Trojans. An early Brock Gilliam basket gave Basehor-Linwood its first lead at 6-4. Guard Joe Gorman also scored an early bucket. After missing his first few shots of the game, Pat Muldoon started to go to work against Wichita State commit Landry Shamet. Muldoon's three late points in the first quarter helped Basehor-Linwood stay within a bucket. All season, the Bobcats have went on quick runs to pull away from teams. On Saturday night, Park Hill delivered an early punch to the Bobcats. A quick 9-0 run helped the Trojans gain an eight-point advantage early in the second quarter. But the Bobcats responded and delivered their own punch. Basehor-Linwood went on an 11-0 run to gain its largest lead of the half at three points. A Dale basket kick-started the run. Carson Fliger scored his first two points of the game and Gilliam brought the Bobcats within four. Jahron McPherson tied the game at 21 and Muldoon added three more points to give Basehor-Linwood a 24-21 lead. Park Hill responded with a quick 9-2 run to regain a four-point lead. Basehor-Linwood scored the final five points of the half, however. Dale hit a key three-pointer to give the Bobcats a 31-30 lead. He scored the final five points of the half, as Basehor-Linwood led 33-30 at halftime. In the second half, it was more of Muldoon and Dale. After exchanging the lead a handful of times early in the third quarter, a five-point burst gave Basehor-Linwood its largest lead at 42-37. A Muldoon basket capped off the run, extending Basehor's lead to nine points at 46-37. A 14-3 Trojans run spanning late from the third quarter to early in the fourth quarter gave Park Hill the lead once again. The fourth quarter alone featured five lead changes and five ties. Dale had two baskets in the fourth quarter that gave Basehor-Linwood the lead. In the entire game, five of Dale's made shots either gave the Bobcats the lead or tied the game. In the final minutes, it was one of those unsung heroes that scored the winning two points. Gilliam's late basket gave Basehor-Linwood a 62-61 lead late in the game. "Brock Gilliam doesn't get rattled," said head coach Mike McBride. "He may mess up, but he just doesn't give up." Two free throws from Dale pushed the lead to three. Jahron McPherson's two free throws extended the lead to 66-61 and Dale capped off his clutch performance with two more free throws. He did not miss a free throw the entire night. Dale scored 22 points and grabbed 7 rebounds in the game. Muldoon finished with 21 points and 14 rebounds. After winning five straight games by at least 15 points, Park Hill provided Basehor-Linwood a challenge that it did not have since the Piper game. There were 12 ties and 12 lead changes during the game. "It was a close game throughout," McBride said. "They had an early eight-point lead, but once we chipped it away, it was a war. There's no doubt both teams have athletes." Speaking of challenges, Muldoon had the challenge of guarding a future Division 1 guard. After Shamet had 8 early points, Muldoon had success against him on both ends. In the final quarter, he helped force two turnovers that were committed by Shamet. Both turnovers came in the final few minutes to help the Bobcats put the nail in the coffin. "The kid is 6'7" and he can guard Division 1 guards," McBride said. "That's my thing with these coaches. He may not always score against them, but he can defend D1 players." 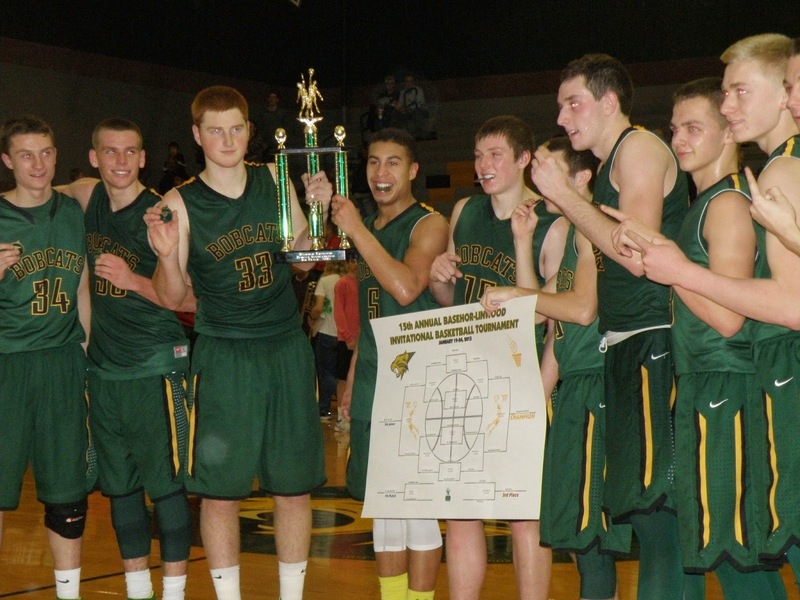 With the win, Basehor-Linwood stays perfect, leaving the tournament with an 11-0 record. They will be in action next Friday at De Soto.